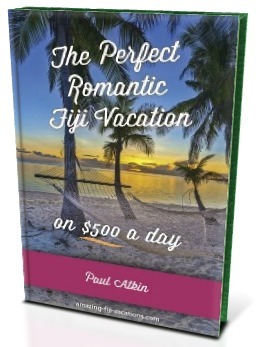 Fiji Romance Guide - A couples fiji romantic guide for $500 a day! Are you a couple going to Fiji on a budget? Discover how to have the perfect romantic getaway in Fiji on $500 a day, by using this romantic Fiji vacation guide. If you were like me and are confused by the hundreds of resorts and packages available, then you can cut to the chase as I've done all the research for you! Fiji is truly a relaxing and stunning location for a magical romantic getaway. However, your getaway could easily unravel ending in tears by choosing the wrong resort/package (maybe it was a busy family resort or maybe terrible service with no TLC). This could easily happen to anyone by choosing a random package, especially off the internet. Then your romantic getaway that you've being waiting for for years (or all relationship!) is a nightmare rather than a fairytale. You don't want this to happen, so don't leave it to chance. All Fiji vacation guides here have been researched and created entirely by Amazing-Fiji-Vacations.com. These guides are unique to Amazing-Fiji-Vacations.com and the only ones of it's kind (that I have seen). You get to discover the most suitable private resorts, for $500 a day, for couples wanting a private, romantic, and relaxing getaway. I have carefully chosen the 4 best tranquil secluded resorts, in my opinion, to maximise the quality of your stay as a couple for this budget. Each of the 4 options has step-by-step cost breakdown for your entire stay in Fiji. * With this budget, you start to access some gorgeously secluded resorts specially for couples! The Island Rendezvous Edition - "The Perfect Romantic Fiji Vacation... on $500 a day!" A 29-page special e-guide taking you step by step showcasing 4 stunning resorts & packages for a budget of $500 a day. It's easy to do, just have your paypal/credit card handy and simply click on the 'buy now' button below. Each special e-guide is in PDF format, and once downloaded, you can read it straight away on your computer. If you do not have the PDF reader, visit here. If you're not completely satisfied, it comes with a 30-day, no questions asked, money-back guarantee. This "The Perfect Romantic Fiji Vacation, on $500 a day!" e-guide belongs to "The Romantic E-guide" series which has guides for budgets ranging from $250 to $5,000 a day per couple. Visit our hub Fiji Vacation Guides page to check the others out.